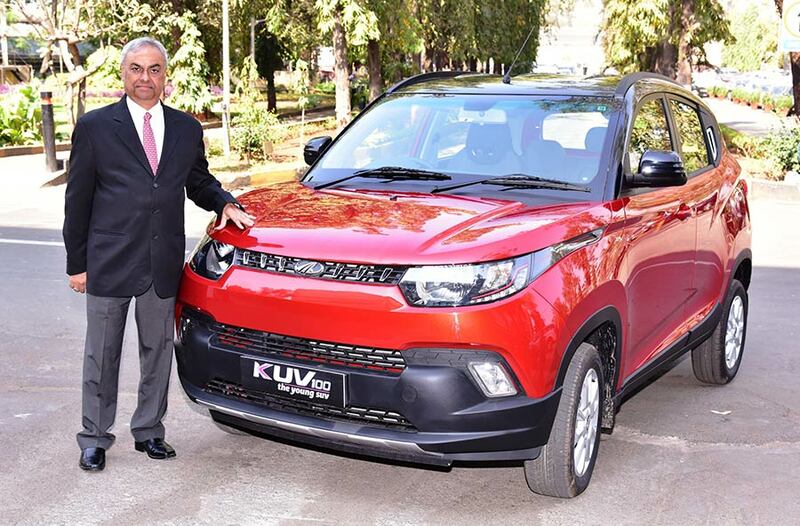 Mahindra & Mahindra Ltd., India’s leading SUV manufacturer, today announced the introduction of a stylish new look for its compact SUV KUV100, as it completes one year on Indian roads. The more stylish KUV100 will be available in the K8 variant with two options for dual tone exterior colour – Flamboyant Red or a Dazzling Silver body with Metallic Black roof. The SUV stance has been enhanced with larger sized 15” alloy wheels with a dynamic design. The interiors get a new sporty black and premium theme. In addition to this the K6 & K6+ variant will now be available with spider design 14” alloy wheels. On the first anniversary of KUV100, we would like to thank our customers for their support in creating a new SUV segment. The KUV100 has the appeal of an SUV and the practicality of a compact car, making it a compelling value proposition. At Mahindra, we constantly update our products in keeping with the latest trends. We have introduced the new avatar of the KUV100 with dual tone exterior colour, sporty and premium black interiors and bigger dynamic design alloys wheels along with various accessory kits. We are confident that it will further build on the KUV100’s style quotient and make it a popular choice amongst the youth.